This entry was posted in Celebrations & Events, Creative Expressions, Fun & Frivolity, IDEA!, Weird Wonderful World, Ya Gotta Have Heart and tagged creative ways to say I love you, tatoos, Valentines Day Sentiments. Bookmark the permalink. Oh those are d– amazing. I always think of how ugly tattoos age. I so glad to inspire you with possibilities and potentials to permanently make your life (and body) even more decorous than it already is. 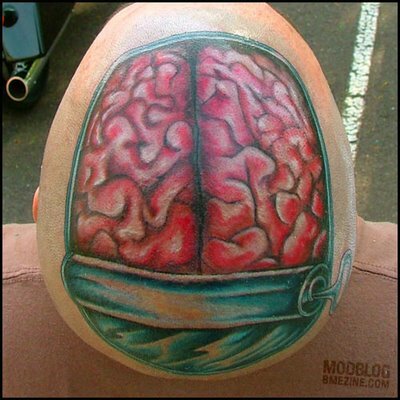 The sardine-tin-can-opener-key-brain (perhaps he considered a “pea-brain” but thought it too whimsical) is nice. I’ll settle for flowers and candy, thanks. I don’t think that a flower and candy tattoo on your head (or other parts) would be very attractive unless you did something masculine like thistles and red-hots. Oh wow, talk about the whole world being your canvas – whew! That’s a needle going into your skin for every drop of dye – yech. Fortunately for me, I care little for Hallmark holidays and prefer to celebrate my Valentine every day. However, a nice box of chocolate isn’t a bad idea. I’m in agreement with you. There’s enough pain in the world without paying for it. However the tattooed lady has the right idea if not the wrong medium!